Josh is Casualty's second longest-running team member, having been a paramedic since series 4. 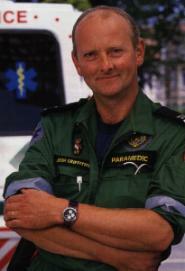 He started out as one of the 'extra' paramedics alongside Keith Cotterill and featured in a few of the series 4 episodes and then became a regular in series 5.He was partners with Jane Scott from series 6 to partway through series 8. At the beginning of series 9 he went out alone by motorbike, but on one occasion he was trapped down a mineshaft on his own with a miner, and after that he decided he wanted to be part of a team again. His next partner was Liz Harker. During series 11, an explosion at his home caused a fire which killed his wife and his two children, and it took him a long time to recover from his loss. He stayed with Liz for a while before he found himself a new flat. In series 12 he returned the favour when Liz left her boyfriend John. Liz decided to leave Holby and his new partner was Penny Hutchens. Josh became involved with Liam, a young boy who was orphaned when his father was killed in a fire. He paid Liam visits at his children's home and organised a charity football match to raise money for a computer for the home. Liam thought a lot of Josh and asked him to adopt him. Josh turned him down, saying they could still be mates, but Liam was upset. Liam eventually forgave Josh at the end of the series. During series 13 Josh became addicted to gambling. He got into debt and the thugs he owed money to beat him up and later ransacked his flat. He told Penny that he felt dead inside and the only thing that made him feel alive apart from a big emergency at work was seeing his horse win. Penny tried to make him give it up and eventually he joined Gamblers Anonymous. There he stood up and told everyone he was addicted to gambling. At the GA he met a woman called Yvonne and they seemed to be getting on rather well. At the beginning of series 15 Josh was embarassed to find that the friend of a patient, whom he had patronised, was in fact Colette Kierney, the new senior staff nurse. Once he had apologised, however, they started to get on well. After a while, pushed by Penny, he asked her out, but their first date was ruined when Colette's mother turned up. Eventually things got on track, however, and they were getting on well. Josh wondered what Helen and his kids would have thought about it, but was reassured by Charlie that they would want him to be happy. Josh wanted to know how serious Colette was about the relationship, so in the last episode he asked her. Before Colette could answer, however, they were interrupted as someone came into the room. Colette introduced the stranger to Josh as her daughter Natalie, put up for adoption at birth sixteen years ago. At the beginning of series 16, on the way to a shout, Josh went through a red light and ended up crashing into a car, putting himself and Fin into danger, and causing the death of teenager Danny Oldfield, who was driving the car. Danny's family ordered an inquest. The verdict was accidental death, putting Josh in the clear, but Josh, knowing he had killed someone, decided to resign, to Colette's dismay. When he was collecting his things from the station, however, he was asked to go on one last shout as they were a paramedic down. He sat talking to a dying girl until the end, and realised that he couldn't be anything but a paramedic, and decided to come back. Things between Josh and Colette had cooled off after everything that happened, until fellow paramedic Comfort stepped in and managed to get them talking. They decided to give things another go, and very soon Josh asked Colette to marry him. Colette agreed, but their wedding day was beset by problems as Colette's daughter Natalie, now pregnant, went into labour and after giving birth, became seriously ill. As Natalie recovered, however, Charlie arranged for them to be wed in the hospital chapel, and Josh and Colette were finally married. In series 17, when Colette suggested to Josh that they go to salsa lessons together, saying they didn't do enough couple-y things, Josh did not want to go. But he was not happy when he found out that Colette had asked Simon instead. He was also depressed when he was unable to carry a woman downstairs, and he and Fin had to call for backup. Colette revealed to Simon that she was worried that there was something wrong with Josh, but when Simon approached him, Josh refused any help or advice. Eventually, however, he saw a doctor and found he had low testosterone, which could be treated. hings were back to normal for a while, but they soon had new problems as Josh wanted them to start a family, but Colette did not want children. When Josh, dealing with a man who had lost his family in a car crash, called off their evening at a charity auction, he was not happy when he picked her up to find that she had gone with Simon instead. Josh was distraught when a few weeks later Colette left him - he didn't realise Colette had slept with Simon at the Christmas party. A few weeks later Colette told him she was pregnant, omitting to tell him that it was Simon's baby. Josh was ecstatic.